HOTB Executive Director Corrie Zoll is hopeful about the organization’s future and believes it is full of exciting possibilities. “This is an extremely painful moment,” Zoll admitted. “At the same time, I’m really looking forward to conversations with people about what is possible.” Last year, HOTB had expected to receive a $30,000 foundation grant that it did not get, which meant that MayDay operated at a loss of over $50,000. This was covered by reserve funds but HOTB can’t continue to do that. The organization doesn’t feel that it can be the sole organizer of the event anymore as it has grown so much. Drop by Feb. 5 to share your ideas at a community meeting, 7-9 p.m. at 1500 E. Lake St.
>> MayDay Parade and Festival will indeed happen this year: Sunday, May 5, 2019. >> In the Heart of the Beast Puppet and Mask Theatre has been the sole producer of MayDay for 45 years. 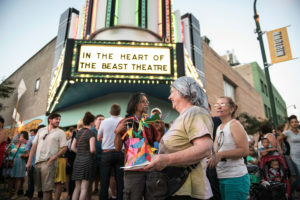 >> Because of fragile financial conditions of the In the Heart of the Beast Theatre, and in order to assure the continuance of MayDay, HOBT is calling for community conversation to evolve the leadership base of MayDay and adapt for sustainability. >> MayDay 2019 will be Sandy Spieler’s last year as MayDay Director (after 45 years). This pre-planned evolution of her own career coincides with other recent financial developments and announcements by In the Heart of the Beast Theatre. >> The first community meeting will be Feb. 5, 7-9 p.m. at the theatre, 1500 E. Lake St. The MayDay theme this year is “Beloved Community.” Attend to help flesh out this theme. >> Community workshops to build MayDay begin on April 6, 2019 at HOTB. Each year, HOTB enables thousands of community residents to participate in the MayDay workshops, the parade, Tree of Life Ceremony, and festival. Next Topic: What’s possible for HOTB, MayDay?